Never broken the rules? Never taken a mulligan? Never brushed a detached leaf, a grain of sand, or a loose twig while taking a back swing in a hazard? Never played by “winter rules”? Never lifted a ball on a putting green without marking it first? Never moved a marker for another player and then forgot to move it back? Never penalized himself incorrectly or unnecessarily? Never made a suggestion to another player which could influence that player’s play (“Keep your head down, you idiot”)? Never pointed out a rules infraction by another player, then agreed to ignore it? Never played out of turn in stroke play (for which there’s no penalty or correction, although it’s still a violation of the rules)? More than a quarter of golfers??? Golf Digest conducted an experiment a few years ago in which a rules official, without saying what he was doing, observed a round of golf by four ordinary guys and kept track of their rules violations. There were so many that he almost couldn’t write fast enough to record them all. 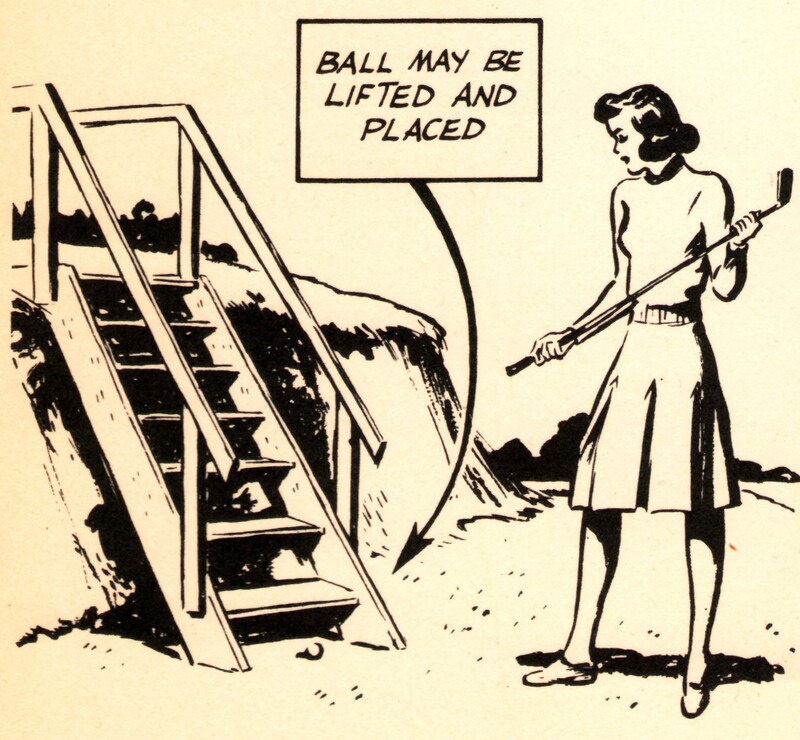 The illustration below is from an old book about the rules. Anyone who can guess which rule it’s illustrating will win a disappointing prize. Meanwhile, anyone who feels like a rules expert should try one of the quizzes on the website of the U.S. Golf Association. This entry was posted in Equipment and tagged illegal equipment, Polara Golf, Rules of Golf by David Owen. Bookmark the permalink. Sounds to me, David, like another similarity to bridge — the difference between serious competitive rules mandated version of golf and a Sunday friendly foursome is same as serious bridge and the many versions and gradations of what I call “sociable” bridge. As I read somewhere once (I think I have quote in my book) — most of what sociable bridge players call “friendly” is unethical play to serious players. Contrast between that and holding up a bidding card is almost comical. [But for me, a cynic about serious bridge, who believes there is no such thing as a totally honest competitive game AS LONG AS SERIOUS PLAYERS INSIST ON PLAYING WITH SAME PARTNER. Could always do thumb positioning, for instance to hold up that card, right? Your lengthy list of all the rules when challenging the 25% who clam NEVER to have broken one? Impossible just as in bridge. I won’t believe it in bridge until tournament players pick their partner’s name out of a hat. A guy I used to play bridge with regularly (now dead, alas) often made what we called “supplemental bids”–mostly groans while sorting his cards. He also used a convention I invented for him, called Friedman Blackwood, in which you show how many aces you have, in response to 4NT, by holding up fingers. is the picture displaying a return to the tee after a lost ball? I think that’s right, or close enough, but now I can’t find the book. I’ll look again this afternoon, after golf. It’s 41 degrees out but I’m wearing shorts because after December 1 we give two extra handicap strokes if you do. from maggy again — I’m going to use that anonymous comment sometime somewhere in my blogging! I KNEW IT!! It’s why despite our casual approach, and inflections when bidding — sociable bridge is probably more honest because we never stay with same partner for long. Unless playing marathon bridge — which is how come I don’t except as a substitute. To Mr. Anonymous: did you consider your Friedman Blackwood convention cheating or just part of competitive bridge?? Hey, wait–I’m the inventor of Friedman Blackwood. I think the cartoon illustrates the stroke and distance penalty. I’m pretty sure that you and Aaron M. are right. I’ll close the contest now, and we can discuss your disappointing prize “off the air.” Meanwhile, let’s all think about the poor illustrator and the impossibility/pointlessness of his assignment. No way…That has to be the one when your driver hits the tee box 8 inches behind your ball and a chunk of turf makes contact with your ball advancing it only 10 ft. Making it possible, of course to return to the box and try again. 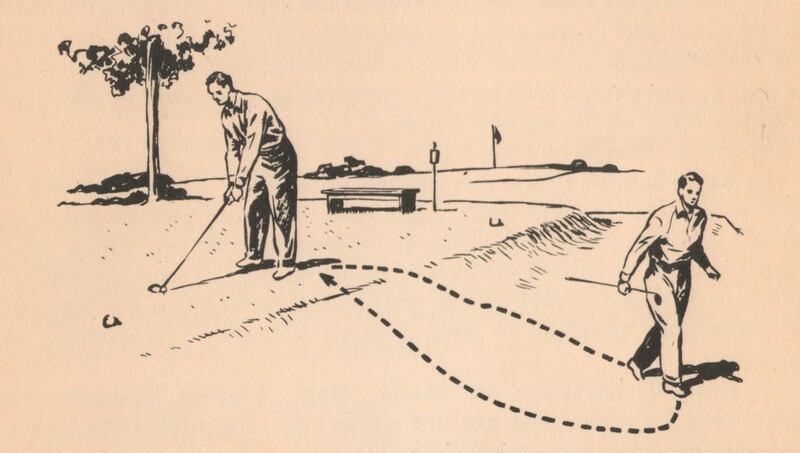 The violation is a player improving the intended path of his golf ball. Player’s partner or caddie indicating line of play.. after 3 shots and a beer in the clubhouse. You’re wrong about the equipment Polara Golf makes David. I’ve played with their golf balls before. They straighten out your hook or slice…and believe it or not…they actually work! Oh, and they don’t make wedges that are “shankproof”…I think you’re confusing them with F2 Golf. I think you’re memory is getting as bad as your golf game these days…LOL! If my memory ever gets to be as bad as my golf game was today, I’ll be in serious trouble. You cannot go back to the tee to play a provisional ball. It must be played before you leave the teeing ground. If golfers are morons, this cartoon is illustrating the most basic rule of all: don’t walk in front of anyone swinging a club. Or maybe “Don’t leave the tee without your golf clubs.” My friends Gene and Nick once walked about halfway up the fourth fairway before remembering they’d taken a cart, which was still parked next to the fourth tee.